Free language learning platform Duolingo is using crowdsourcing to solve the problem of adding more languages to its service. 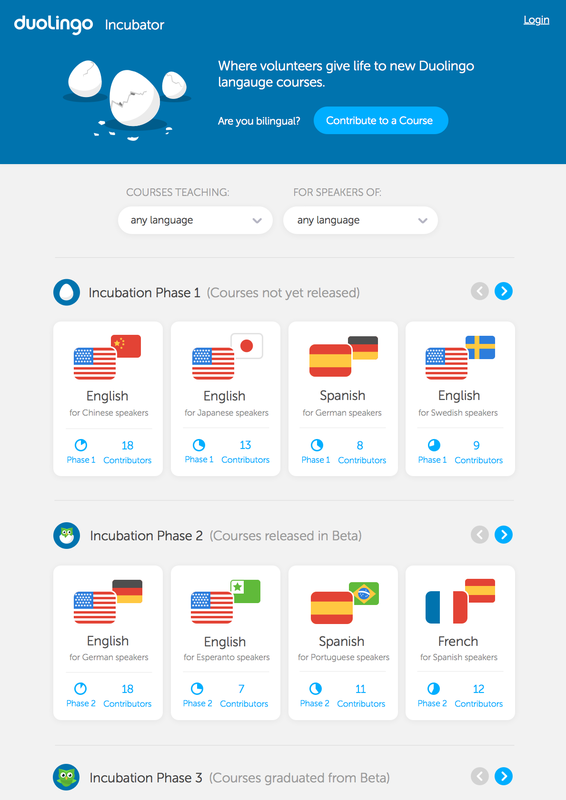 It announced today the launch of a program called the Language Incubator, which will let native speakers and language enthusiasts create courses that an algorithm will subsequently ensure are in line with Duolingo’s standards. None of these course creators will get paid, but as Duolingo provides its services entirely for free — and people are thus inclined to contribute to the platform — the company says it already has thousands of people volunteering to help. This means that from the six languages Duolingo has offered in the 15 months it has been live, the number of languages will go up dramatically — as long as people are creating language courses. Duolingo says its latest move “will enable the inclusion of every language in the world, including fictional languages such as Dothraki and Elvish.” Whether anyone actually knows these languages is another matter entirely. Popular languages that are available in this launch include Chinese, Russian, Japanese and Arabic. One of the co-founders of Duolingo is Luis von Ahn, who is far from a newcomer when it comes to leveraging the power of the crowd, being one of the creators of the CAPTCHA method of verification. Duolingo claims that its translation quality can rival the work of professional translators, and is monetizing by selling these translations to third parties.